Vodafone K.K. 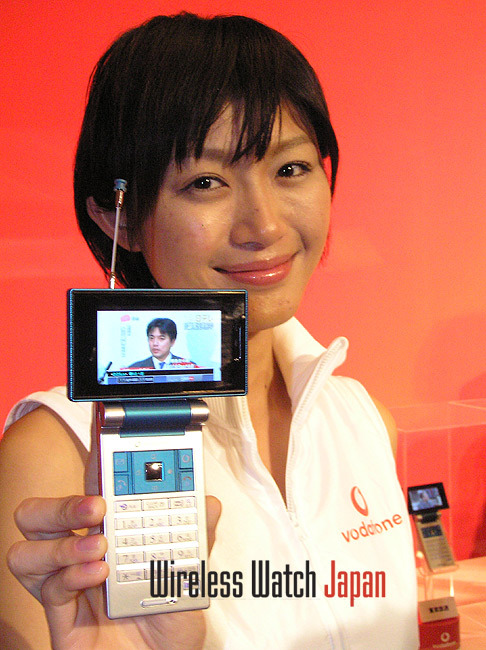 today announced the development of the Vodafone 905SH [.jpg] by Sharp, a new 3G handset capable of receiving “One Seg” terrestrial digital TV broadcasts. The new model is planned for release by June 2006, in time for scheduled the upcoming World Cup football matches. This handset features a new Cycloid Style rotating display for easy mobile TV viewing , a design innovation which will enable customers to enjoy digital TV broadcasts in 400 x 240 pixel resolution, full widescreen 16:9 aspect ratio format. In addition to hand-held viewing, the Vodafone 905SH is also great for relaxed TV enjoyment at home even in open position, the handset is stable when placed on a flat surface and set at a desired viewing angle. 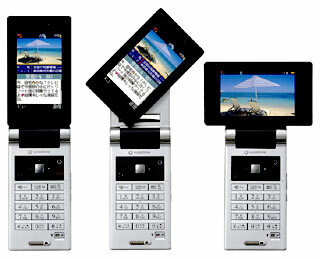 The handset has a large-size 2.6-inch Mobile ASV LCD, which is based on ASV (Advanced Super View) technology for vivid, wide-angle viewing, found in Sharp’s AQUOS line of LCD TVs. A 6 colour filter also enables unrivaled colour purity in digital and analogue TV broadcasts, even while outdoors. See the Vodafone .PDF for full details.